Ah, Disney World: the globe’s largest tourist trap, the Mecca of moms everywhere, and the ‘happiest place on earth.’ Daniel and I finally visited Disney World (both of us had gone as children, but only remember bits and pieces of it) and it was exciting to experience this ‘place of dreams’ as adults. We were able to dine with Winnie the Pooh, party away the New Year in ‘China’ and spark up good conversation about the pros and cons of adding this amusement park to your travels. As an adult, if you ever get the chance to visit Epcot on New Year’s Eve, you absolutely should. Keep in mind, it is Disney World’s busiest day of the year (we tend to find this is the case, no matter where we go on New Year’s Eve ... it is an interesting anniversary date, for sure!) The park was so busy that night that Disney World staff were literally performing ‘traffic control’; they had set up round-abouts in the park where everyone had to move in the same direction and then get off at their appropriate exit, and we were to stay on the right of the walkway at all times, just like car traffic. It was hysterical! Only once did we find ourselves in shoulder-to-shoulder, barely-inching-forward crowds when we bottlenecked at a bridge; but that’s when the staff opened an emergency exit and allowed part of the crowd to go across that way. It was an interesting experience, but Daniel and I are used to crowds so this didn’t put us off at all. The shoulder-to-shoulder traffic trying to get across a bridge that isn't even pictured. Once night falls and the first set of fireworks go off at 6pm, most of the families leave the park and it turns into one big rave. People with glowing merchandise, flashing Mickey ears, and complimentary noise makers were dancing at each ‘country’s’ party; and everywhere we looked, country-specific cocktails were being served with neon flashing ‘ice cubes’ in them. We got ourselves champagne from ‘France,’ and then spent a good part of the night at China’s party. The energy was great, and their set included dragons that breathed 'fire' (aka steam) over the crowd. 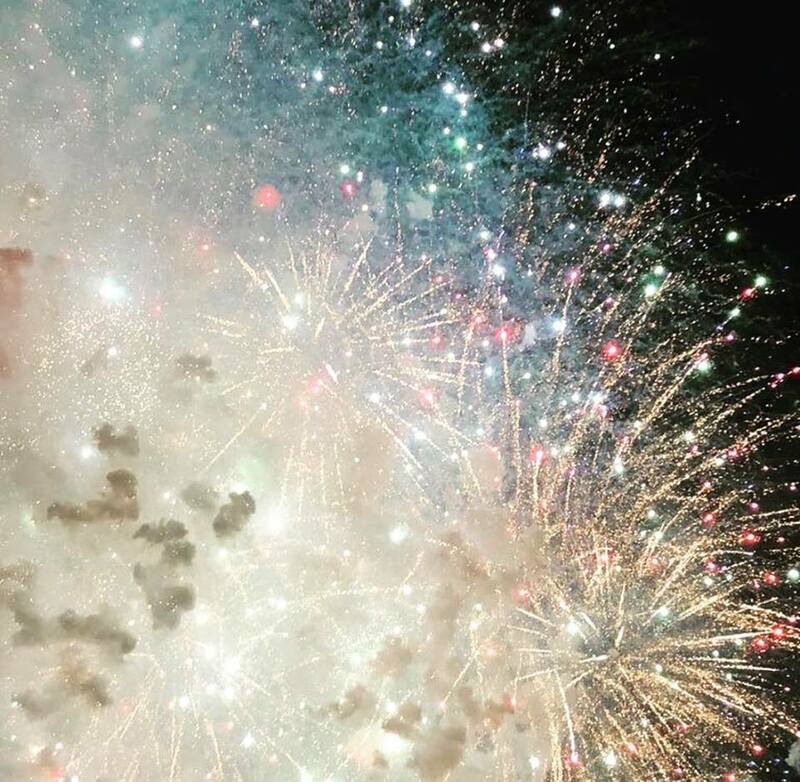 The 30-minute firework show began just before midnight; and the show included smaller fireworks being shot off from each of the ‘countries,’ so even if you think you don’t have a good view of the fireworks because of the crowd, most of the show will still be visible to you. The only part you may miss are the lasers and fountains at the beginning of the show; but really, there were so many incredible things to see that day that we didn’t mind missing some lasers. And just as it is every single year, no matter where we are, the countdown to midnight was the most electric part of the night, and the crowd erupted with their cheers, bubbles, pulsing lights and noisemakers when the clock struck midnight. Disney World tugs on the nostalgia of adults, and turns children’s fiction into reality with their character meet-and-greets. Each meet-and-greet is built around the specific character you’re greeting - for instance, Jasmine can be found in Epcot’s ‘Morocco’ amidst shelves of ornate gold and lamps. And she is completely in character; she asked me if my genie had done my (dyed-green) hair. Daniel most wanted to meet Baymax, who was tucked into ‘San Frantokyo.' Everyone in line was asked to remove any jewelry or anything sharp, because the costume was inflatable, just like in the movies. And though the ‘robot’ didn’t talk to Daniel, he did make sure to do his infamous fist bump, then give him a hug. My favorite meet-and-greet, though, was Kylo Ren. Most of the characters, you have to walk up to yourself, but Kylo Ren rounds a corner and menacingly towers over you as he asks you whether or not you’re a rebel. He then nods to his handlers and ‘allows’ us in. I had a bit of a conversation with Kylo (he said the force was strong with me! ), then we took our pictures. The handlers then asked “permission to request a second scanning, sir?” Kylo granted their permission, and then Daniel and I swapped so that Daniel could get a photo with him as well. The way the handlers interact with the characters adds to the ‘reality’ they are trying to build, and it’s an enjoyable experience as a result. A lot of people rave about Epcot’s food; it was really interesting to discover that Epcot serves only a fraction of what we have available to us in New York City. Though it’s wonderful that Epcot makes available to the general populace of America things like bao buns, shepherd’s salad and tikka marsala, NYC offers all of the same, but for cheaper prices and better quality. So when we say the food was a highlight, we’re actually not talking about the cafeterias or stands that you can find throughout the parks - those meals are so mass-produced by large assembly lines that it’s almost impossible to offer the freshest ingredients. What was a huge highlight in regards to food was the sit-down dinners we were able to snag reservations to! We booked our Disney World tickets quite late compared to most people planning Disney vacations; and as such, every single dinner reservation across all four parks was booked out. So our plan was to keep an eye on the ‘My Disney Experience’ app (an app that shows reservations and wait times on a giant map) and snag a cancelled reservation as soon as it appeared. We were able to book our New Year’s Eve dinner at the Biergarten in Epcot’s ‘Germany’ the week before our trip, and on our second day, we booked a dinner reservation at the Crystal Palace in Magic Kingdom just 25 minutes before we had to be there! Both experiences were absolutely delicious (albeit expensive; the bill ended up being over $100 both times) and both were buffets that boast the quality of Vegas buffets. The Biergarten had (no surprise) delicious beer, and mountains of schnitzel, sauerkraut, cucumber salad, bratwurst, soft pretzel rolls, potato salad, and on and on and on. The Crystal Palace had an American menu: salmon, sirloin with horseradish, chicken fingers, Mac & cheese, meatloaf, Caesar salad. And the best part about The Crystal Palace? You get to dine with Winnie the Pooh and his friends! The moment when we felt that magic that everyone talks about was when we were watching the Magic Kingdom’s ‘Happily Ever After’ fireworks show. This show happens every night; it’s a grand display of gorgeous fireworks over the infamous Disney castle, and it’s paired with a composition of projections that make the castle come alive. Nearly every Disney character is projected onto the castle during the 18 minute show, dancing to songs like ‘Friend Like Me’ ‘Love is an Open Door’ and ‘I Can Go the Distance’ (and many more - but surprisingly not the overly-popular ones!) Characters like Baloo from the Jungle Book and Edna from The Incredibles are mixed into scenes of Ariel and Aladdin, and there is even a montage when all of the villains take over the castle and green fireworks and smoke explode into the air. At some points, the fireworks would become a prop; a projection of Merida from Brave would shoot her arrow, and a firework was launched off off in the same direction. My favorite part, however, was when Tinker Bell - a real live Tinker Bell - literally ‘flew’ over and away from the castle just like she does in movies right before a Disney show starts. It was absolutely phenomenal. We learned quite early on that you have to be 'Type' A to travel to Disney World. I was genuinely shocked to realize that people plan their trip to Disney World over 6 months in advance. Daniel and I have traveled internationally with far less prep. And what makes the thousands of families’ prep so obvious? The fact that dinner reservations and ride reservations were booked out across all four parks on both of the days we were planning on spending there. Yes, you read that right: ride reservations. Thousands of people actually book the exact hour that they’re going to show up to rides throughout the day (on top of their one, sometimes two, meal reservations.) Daniel and I don’t work like this; when we travel, we have a list of things we’d like to see or do, then we spend our time wandering and exploring and checking off our list in our own time. In fact, specific time reservations stress me out. So we decided to go about Disney World the same way; it may not have been the most efficient way to use our time. We ended up missing out on rides like Space Mountain, and there was no way we were going to be able to meet Elsa. But we didn’t mind the give-and-take; we stood in line for the three rides we truly cared about going on (Test Track at Epcot, Tower of Terror in Hollywood Studios, and the Safari in Animal Kingdom.) And we happened to hit the lines just right so that we spent no more than 20 minutes waiting in line to meet each of our favorite characters (Jasmine, Baymax and Kylo Ren). The rest of the day was spent wandering, watching performances, taking pictures, and partying at Epcot. The only reservation we had to rush to during each day was our last minute dinner reservations. It’s a stress-free approach to Disney World; but if you decide to go this route, you may (no, you probably will) miss out on the top attractions. Daniel and I were genuinely surprised by the way Disney World failed to bring the ‘worlds’ to life. What I mean by this is that Universal Studios is designed so that, even as you walk through the park or stand in line, the ‘world’ of the movie you’re in is alive all around you. Harry Potter World (the undeniably best part of Universal Studios) has magic spells that you can learn throughout the park, a dragon that breathes fire in the middle of the square, goblins you can meet as you wait in line to enter Gringotts, and even a wizarding currency that you can transfer your money to. 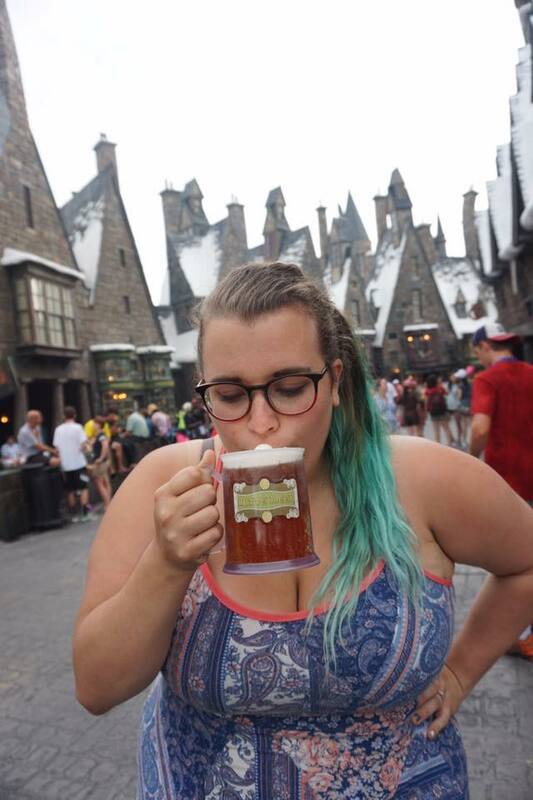 (And that butterbeer though!) But Harry Potter World isn’t the only part of Universal Studios that is immersive: the King Kong ride has indigenous ceremonies performed in front of you as you wait in line, and the line you wait in for the Revenge of the Mummy ride has - well, without any spoilers - corners that you turn around that might just make you scream! Disney World, however: the endless lines are mindless. There is nothing to do or see to keep you busy as you wait for over two hours. The only time you enter the world is when you’re on the ride, or inside some other structure that you’ve waited hours to get into. The best example of this is Disney World’s new Avatar park in Animal Kingdom. The sets in this ‘world’ are beautiful: giant, floating mountains and exotic flowers loom before you. But, it’s all set up behind ropes. We can’t help but think that if Universal had built the Avatar park, it would have been more accessible: the mountains would be climbable, and there’d be flowers that would open when you touch them or bioluminescence that glows at night. Picture taken during our trip to Universal in July, 2016. I absolutely see the appeal of Disney World when it comes to booking a family vacation; the park is literally created to be a family-friendly place, and Disney culture is an undeniably important part of every childhood. But with the prices and lines, we can’t help but wonder if that money and time would be best spent when invested into the economy of a local town, or used to teach children more about the world we do live in. Instead of bringing them to meet Elsa, they could visit a real ‘Winter Wonderland’ like Quebec City or Iceland. Instead of taking them to the Star Wars park, take them to the Salt Flats in Utah or Bolivia to see that ‘Planet Crait’ in The Last Jedi is actually really a part of our gorgeous world. Instead of Animal Kingdom, take your children to a true African Safari; your money would be going straight to the local conservation of these wild animals. (Don’t have ‘African Safari’ in your budget? Go to the San Diego Zoo!) There is real magic all over our globe, and a child would only benefit from experiencing it.